Thanks everyone for the kind comments. I am watching this thing closely...taking my Bayer asprin and using my peroxide daily. It is calming down now and I can relax and even got a few hours sleep. That is the hard part...sleeping. Pain wakes you up a lot...lol. So, I will put you down for hosting February Kendall. Maybe Alexa and you can do a team like Cho and JR did. Look forward to the theme you will muster up. Well what can your dog do? Little Mary is showing off to her new alien friend with the tricks that her dog can do. What can his dog? Cute! That alien looks quite miffed! Nice one, well done. Enrty Accepted. If you really need a link for it, I can tell you where to find the copy on Fisty's website... but I'm not sure whether I should, so I'd prefer not to simply post the link. Okay folks just over one day left for the Mini Contest. Then I'll let the Judges loose and with luck on our side we will have a winner by Monday Afternoon US Central time. If your doing one remember Midnight DAZ time tomorrow (25th) is the close. If you have done one Thank You and Good luck in the contest. search for " LDFujiHairGn.zip" and " LDFujiHairV4.zip"
At this time As the Creator of the Mini Contest I will only judge if there is a Tie that must be Broken. The Same will apply to the Full Freebie contest. As the Co-Host Chohole is a Judge and my Backup for those times I just can not be here due to health or other reasons. Jaderail : Main Host and will only vote to Break Ties. Chohole : Co-Host and Judge for Both contests. robkelk : Judge for Both Contests. jeeperz : Judge for both Contests. As you can see we have three judges that you all know and can trust (I tink :) ) So I hope to not need to Vote as the Main Sponsor and Host. I hope that this meets with approval for everyone at this time. If not we still have a few days to add more judges. Totes a Unicorn, Mom! And only $5 to pet him! Green texture for Mil Horse 1 - Dreamweaver site gone?? And a green one at that! DreamWeaver has been working on a update to her horse texture sets. I forget where they are right now. Ah, ok! Thanks! 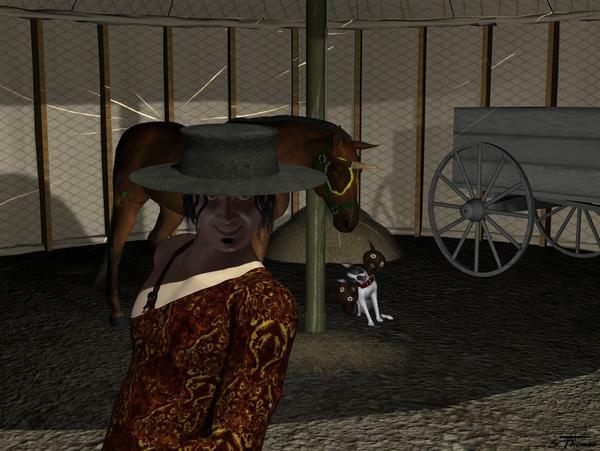 I love the Dreamweaver horse textures. Hi! I looked at the Gallery and my main contest entry, Who Will Be Next is in the Mini contest area. Links Checked, Entry Accepted. Way to go, I like the Idea. Mini Contest Closed. Thank you all for playing. With luck we will have the Winner Picked by Monday my Time (Central USA). With even more luck the Prize can be awarded if the GC's are fixed by then. Didn't think my idea was too original. Actually, I was surprised no one else had already posted something like this. Looks like my picks and your reminder crossed in the PM stream...LOL!! That happens. Thank You. For the info.